On July 16, 2009, a mortar strike killed three soldiers from my unit. We named a gym, a clinic, and a store on base after them. But another soldier from that deployment died too, years afterward, and his death is one I’m still trying to process. 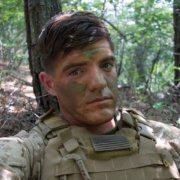 His name was James Belland, and he was one of my closest friends on a year-long tour to Basra, Iraq, where we were both privates on a base with too many officers, in a war where nothing awful happened until it did. Belland was a dude with a friendly roundness to him, a head like a peeled potato, and on that face, always a grin. I remember, one night, walking through the base trailer park, I heard strumming from the guitar he had brought to Iraq from Minnesota. 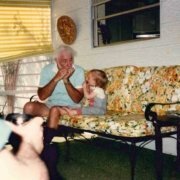 Belland saw me, told me to pop a squat, join the circle of a few of his friends, and listen to some gentle acoustic song. He asked me what I thought and I told him; the song was sweet, like one of those fun late-night summer beach parties I was never invited to. But now, 7,000 miles from home, Belland had gone out of his way to include me, to invite me to his party out by the blast walls. Earlier this year, four years after his death, I called his wife, Ashley, and his younger brother, Zach, and they generously shared with me their memories of Belland. Belland spent his childhood playing hockey and beating up his younger brother, his younger brother joked to me. The elder Belland signed up for the Army as soon as he could, at 17. 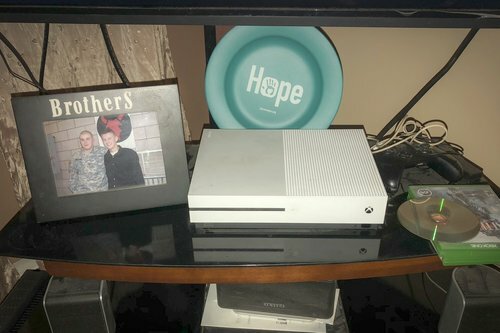 He sent his younger brother letters from basic at Fort Benning about his newer, buffer self. 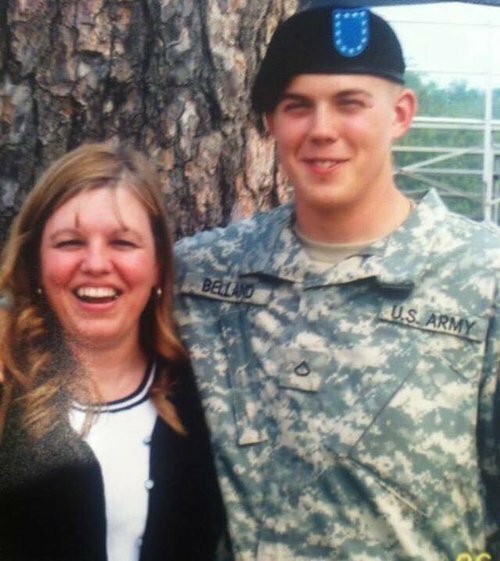 Belland met his wife, Ashley, while he was helping recruit potential Guardsmen at a Best Buy in the Twin Cities suburbs. He asked her if she’d like to join the Army. She didn’t like that idea, but she liked him OK. They liked the same music. As a teen, Belland had gone through a pop-punk phase, the whole deal: the big blue mohawk, spikes, eyeliner. His head was shaved for the Army when Ashley met him, but they could headbang together, although it wasn’t quite the same without the blue hair. 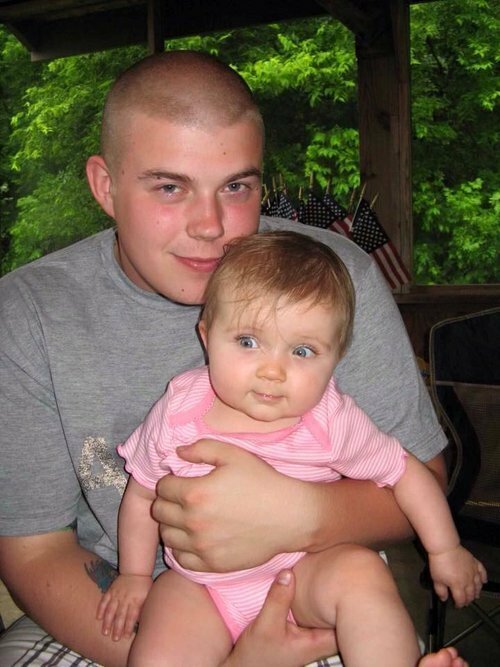 She got pregnant with their first child as he was training to head to Iraq. 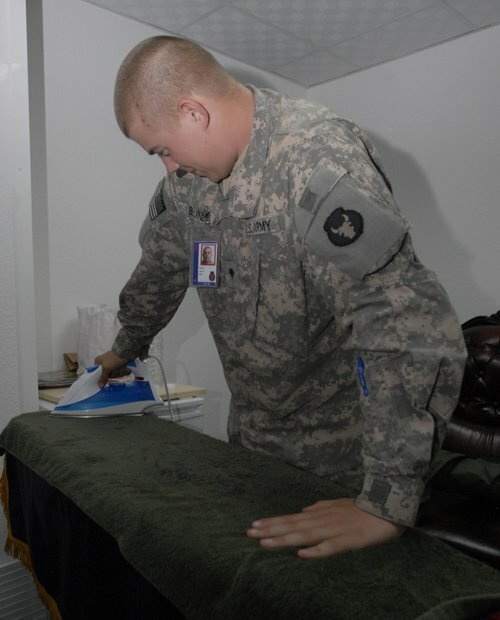 She had the baby while he was on the other side of the world, on a National Guard deployment he had volunteered for because he wanted one crazy experience before growing up. Deployment was where I met him. He seemed to know everyone in our unit on our quiet POG-year abroad, which was interrupted only by mortar strikes one day that killed three of us. Their names were Specialist Carlos Wilcox, 27; Specialist Daniel Drevnick, 22; and Specialist James Wertish, 20. Belland knew them too. Belland had a job on deployment that he hated. He answered the call to join the U.S. infantry, but on deployment, he spent his time babysitting VIPs, generals, and politicians. They’d fly in for photo ops, and he’d small-talk with them as they waited for their flights out. He was cynical about the bigwigs and would tell me this as he ironed flags. At the time, he thought his job was pretty useless. His brother said Belland called him shortly after coming home from Iraq. Belland wanted to hang out, get a beer. The younger Belland figured his older brother missed that band-of-brothers feeling, so, logically, he called his actual brother. 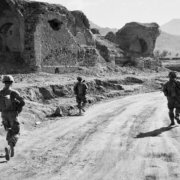 Though Belland had hated what he was doing when we were in Iraq, now he missed it, because at least it was constant. He got home, and, like a shark, he couldn’t stop. The two met up and began working out together, barbells and rope pulldowns, Belland going so hard, his brother said, that he puked trying to keep up. To me, it seemed as if the gym was where Belland could try to become the other, better self he still wanted after joining the Army and going to Iraq. Because where do you go for transformation when you’ve already run away and joined the circus once? He began to close up like a clam, his wife said. Belland had always been so open with her, but when he shut up, she didn’t want to pry him open with force. She waited for the happy-go-lucky kid to reemerge and tell her his secrets again. They had a second kid, another daughter. They bought a house bigger than the home where Belland had grown up. That was always Belland’s dream, his brother said. Anxiety attacks bit him, more and more of them. His family had a history with anxiety, his brother said. Belland got out of the National Guard and got a job at a bank, which he quit. His brother got him another job at the steel plant where he worked, but Belland left after three hours. One day, as his wife drove him down the highway, an anxiety attack hit him. She stopped the car on the shoulder of the highway so he could throw up, his vomit splattering on the side of the road. He started to drink more and more, his brother told me this year, to take the edge off. On the first anniversary of the day of the mortar attacks, he hit the bar and slammed down his favorite 100-proof liquor, Rumple Minze, a schnapps that his brother always thought tasted medicinal, like mouthwash. Belland did the same thing on the next anniversary. 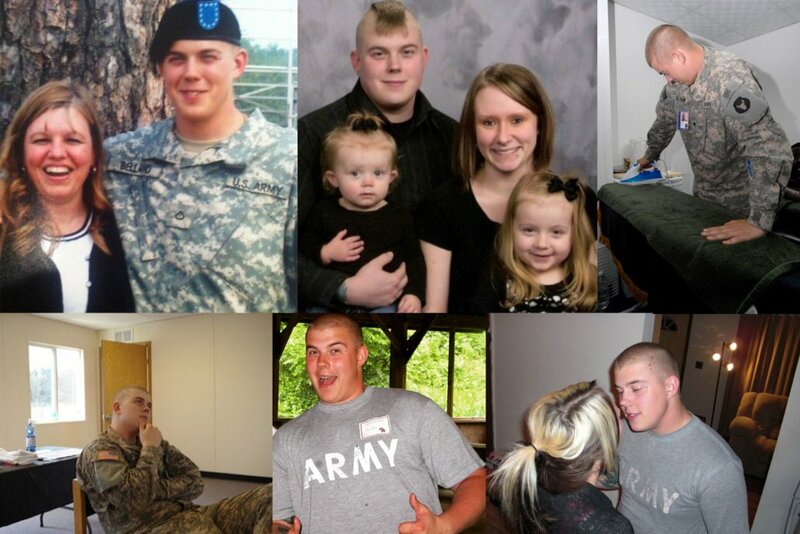 His coworkers said the deaths of the three soldiers—Wilcox, Drevnick, Wertish—hit him hard. The worse the anxiety got, the more Belland stayed in the basement of his dream home, playing video games and watching movies and feeling useless. His brother would play video game hockey and watch dumb comedy movies with him to pass the time. Just being in the same room seemed to help. Belland begged his wife to come back, told Ashley he would quit heroin. And he did, and she came back. The day of his death came the day before his brother’s birthday. His brother had called Belland and made party plans. An hour later the brother got a call from Belland’s wife: He was using again—secretly, for two months. His brother saw an ambulance barreling down the highway on his way to his brother’s house. His wife said the cops came and kicked down the locked bathroom door; Belland’s body was inside. An overdose: His tolerance was down. He was 26 when he died; it was on Aug. 15, 2014. Even now, years later, his wife still talks to Belland. She tells his daughters that their father was sick. She has his name tape where his daughters can see it. She told me: “I think there was a select few people who knew what was going on, but nobody was really his friend until after he died. … I don’t think he told a lot of people.” I felt ashamed that there was so much I hadn’t known. I was content with my image of him as my happy-go-lucky deployment friend. He was sick and I didn’t even know about it, let alone help. I wondered what I could have done, had I known. His wife, too, still wonders if there was anything that could have been done to prevent his death, but she doesn’t know the answer. I think sometimes of how the deaths of Wilcox, Drevnick, and Wertish seemed at the time a bolt from the blue, as unlikely as a lightning strike. I think of ways their deaths could have been prevented, but perhaps that’s just a way of wresting back control from a universe that takes away lives without giving a receipt. I feel compassion for Belland’s family, who only want people to know what a light their husband and brother was. In the years since, his brother has had a child and given him the middle name James, after his older brother. The smile on Belland’s round face still beams from the wall of photos above the Xbox where the two brothers would play video games, during the days when Belland couldn’t walk outside. His brother told me, those photos of him seem to stand at just about the right place.